Home Basic Date Questions Conversion Problems How to convert Date to ZonedDateTime in Java? Write a program in Java that converts current Date to ZonedDateTime. * @problem How to convert Date to ZonedDateTime? // Instant + default time zone. Output - How to convert Date to ZonedDateTime in Java? 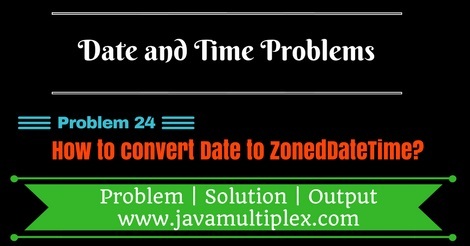 How to convert given Date to ZonedDateTime in Java? Tags : Date and Time problems, Conversion problems, Date to ZonedDateTime in Java, Solution in Java, Instant, ZoneId. Thank you Raghu for giving your valuable feedback.